An enjoyable little walk from Jockey Shield to the top of Simmerson Hill enjoying fantastic views of Geltsdale before returning via the currick building site on Talkin Fell. This was the first day of our week based in Armathwaite in the Eden Valley. Already, earlier in the day, I’d done a super walk with Lisa and Rhiannon visiting Long Meg and Lacy’s Caves. After that walk we’d driven to our cottage in Armathwaite. It was only mid-afternoon and the weather was so lovely outside I was itching to get back out. With Lisa and Rhiannon happy to chill out and unpack I decided to head out for a drive up to Castle Carrock for this short walk. I’d first visited Simmerson Hill and Talkin Fell back in February 2011 when my friend Matt and I had decided to tag them on to the end of a walk as we made our way down from Cold Fell. By that point the skies had clouded over and the views weren’t great. The super collection of curricks on Talkin Fell stayed in my memory though. That and the fact that Simmerson Hill is on my list of North Pennine hills over 400m meant that I needed to revisit it for a closer look at some point. Driving through Castle Carrock I continued on the minor road heading up Geltsdale to a parking area at a bend in the road next to the house at Jockey Shield. From the bend a track descends down to Hynam Bridge and the River Gelt. Walking down this track I spotted what looked like a brass bolt with the letters E A and B M engraved on it. It looked like some kind of benchmark but not a type I’ve come across before. Crossing over Hynam Bridge I walked a short distance upstream alongside the Gelt. At the entrance to High Hynam I took a track climbing up to the left. This slanted up gradually above the valley to provide increasingly fantastic views of Geltsdale and Cumrew Fell. As the track began to level out Tarnmonath Fell appeared ahead whilst the modest rocky rim of Simmerson Hill also appeared up to the left. After the path began to drop slightly I kept my eye out for a wall which is shown on the map climbing up the southern flank of Simmerson Hill. The wall no longer exists but a decent path was found. This climbed up to then curve round and form into a fine little path above the broken crag on Simmerson Hill. As the path swung around to the north nearby Talkin Fell came into view. At about grid reference NY575560 I made a detour from the path for a short walk across the heather to the summit cairn. This has been fashioned into a small seat. It was a grand place to enjoy the panorama. This included nearby Cold Fell, Geltsdale, some of the northern fells of the Lake District, Criffel in Galloway, the hills of the Scottish borders and Hadrian’s Wall country. Returning to the path I continued on to a fence. The path then dropped down before passing through a gate in a fence on the right. Turning left the path then climbed up to round a wall corner to a stile. Crossing over the stile I was then on the summit of Talkin Fell. The highest point is marked by a trig point, called Kelky Fell on the Ordnance Survey database. Normally a trig point is the highlight feature for me on a hill summit, this is not the case however on Talkin Fell. This is because immediately to the east of the trig point there are a host of curricks (cairns) of various sizes. Some are just inches high but there must be a good 25-30 decent sized specimens. Immediately beyond the curricks there is a super view west towards the Solway Coast. Down to the right meanwhile was a good view of Talkin Tarn. Another fine feature alongside the curricks is a heart-shaped stone shelter. 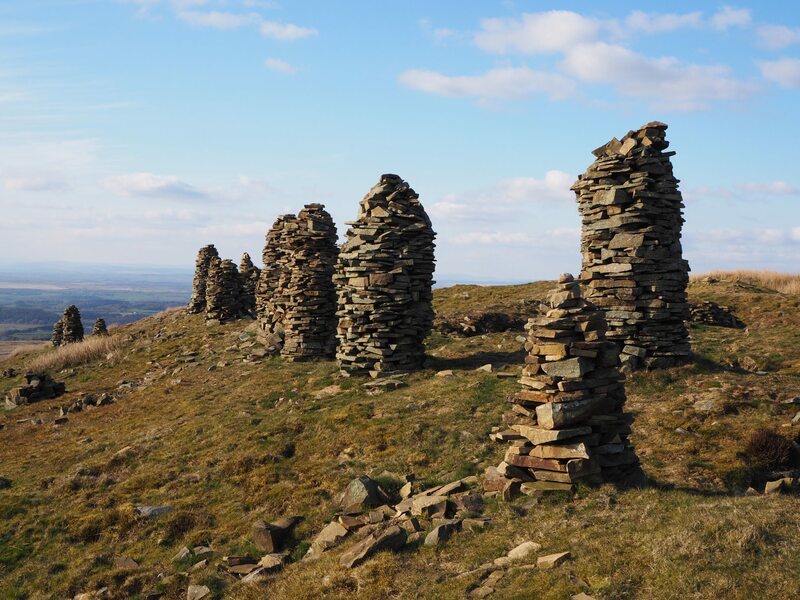 All in all Talkin Fell (or Kelky Fell if you prefer) has one of the finest summits in the North Pennines. After spending some time taking photos I returned to the stile. Crossing back over I didn’t retrace my steps down to the col but instead followed the wall on my right. This came to a broken stile, crossing this I then enjoyed a nice little descent alongside the wall with Simmerson Hill to my left and a good view of Geltsdale ahead of me. The path soon joined an enclosed track. Turning down this I followed it for an enjoyable three quarters of a mile until it reached the top of Holme Gill. All along this stretch there were more good views of Geltsdale. At Holme Gill I took a path dropping down through the woods to reach a track above Low Hynam. Turning left I soon arrived back at Hynam Bridge and the track leading back up to Jockey Shield. This was a super little walk, perfect if you only have a couple of hours to spare but want good views.